A highly refined Chinese Elm bonsai, perfect for beginners, with all the accessories to get started in growing bonsai trees. Fabulous gift with cheerful Birthday balloon and free care instructions. 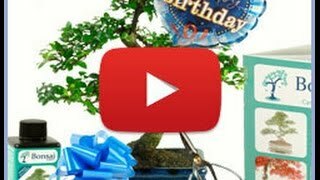 The ultimate comprehensive bonsai birthday gift set. Great bonsai birthday gift for your husband, brother, boyfriend, father or granddad.